The Norse gods are once again impressed with your slot playing abilities and are inviting you to compete in their newest online slot to win a hefty amount in cash prizes. Click here to play! The Thunderstruck II logo is your key into this sacred game. Spin this symbol as much as possible as it holds a game toping payout worth up to 1,000 times your line bet. They are also a substitute and will double all payouts when they appear in a winning combination. Once in, join the gods as the battle between good and evil ensues. Thor the mighty warrior is a force for good and will payout up to 500 times your line bet. Oden sees all and will help you in your quest for cash by gaining up to 450 times your line bet if you can spin three or more across an active payline. Locki and Valkyrie also wander these reels and will payout generous sums. 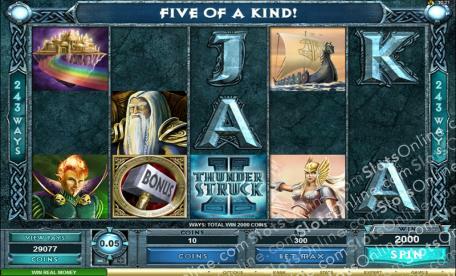 All four of these gods will also award a number of free spins. Thor’s hammer is a bonus symbol, so be sure to spin as many as possible to trigger the Great Hall of Spins. Multiple entries into the Great Hall will unlock further bonus features. Join the gods as they engage in battle between good and evil and you could end up walking away with a handsome reward. The Thunderstruck II logo is a wild. It will replace all others, excluding the bonus symbol, and will double payouts when it appears in a winning combo. There are two bonus features in this game. The first is the Wildstorm Feature that is triggered randomly. The second is the Great Hall of Spins, which is triggered by three or more of Thor's Hammer across the reels. During this feature you will get a number of free spins. The more you trigger the bonus feature, the more bonus spins you'll unlock.